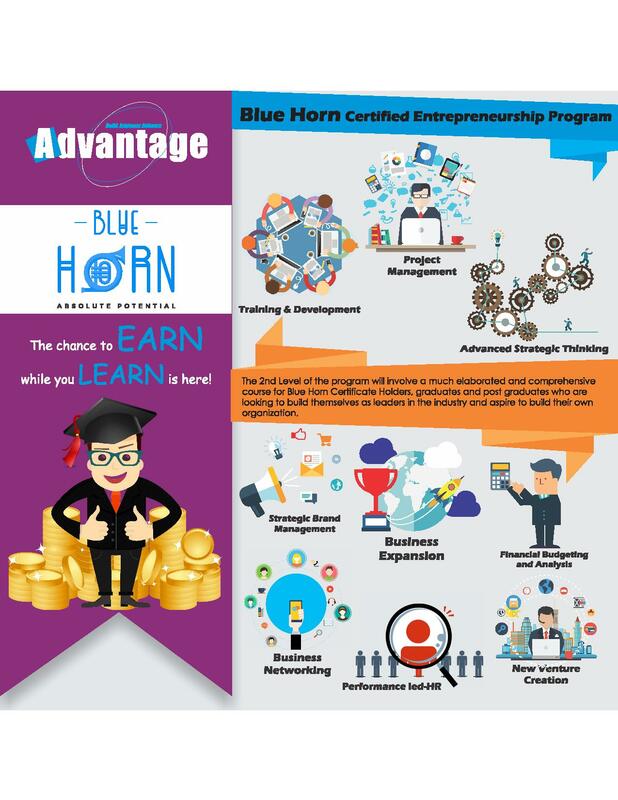 We at Blue Horn offer a certified training program called 'Blue Horn Advantage Training Program', which is designed in a holistic manner to enhance your skills in all entrepreneurial aspects. 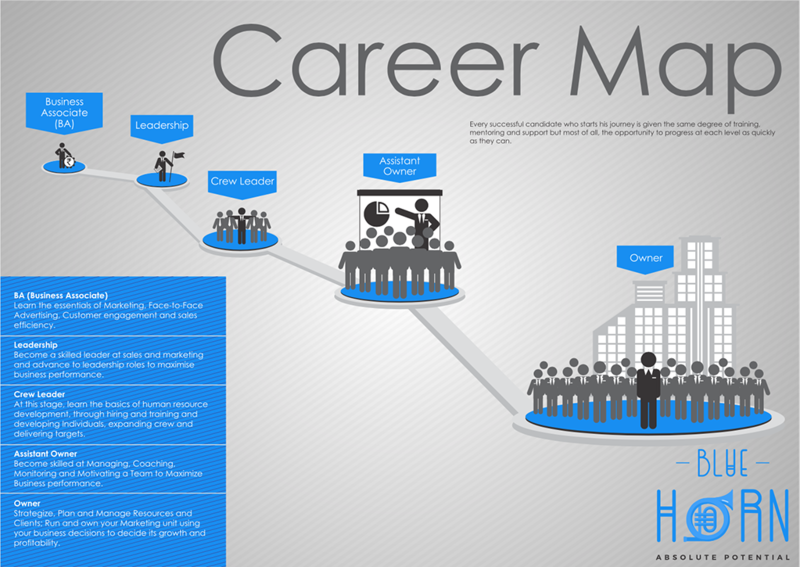 The Career development path illustrated above shows you how we guide and develop people from a sales and marketing role (Business Associate) all the way through to management and strategy positions (Leadership right through to Ownership). 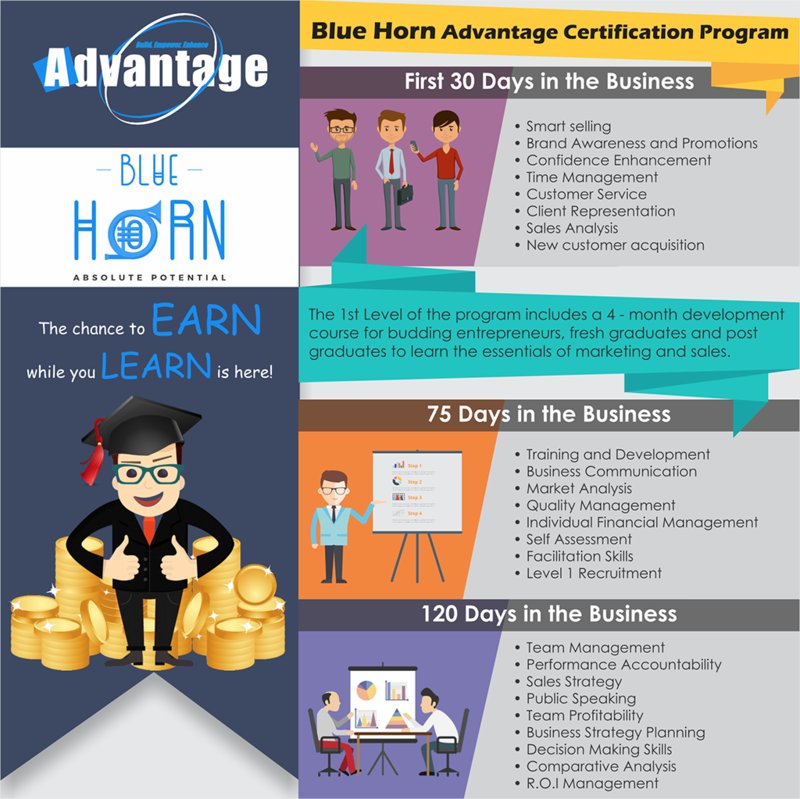 Every potentional candidate who is accepted is put into a 5-STEP Certified Business Development Programme and are given the same degree of training, mentoring and support, but most of all the opportunity to progress through the program depends on the candidates individual performance. During the first 120 days of training you will get trained on 3 aspects. First, you will learn the essentials of Sales and Marketing, Customer Relationship and engagement through face to face interaction with customers and clients. During the second & third stage you will learn the basics of Human Resource Development, through hiring and training and developing individuals, eventually you will get trained on managing and leading a crew/team by specializing in Conflict Management, Sector Management and, Performance Appraisal to deliver maximum performance. In the Advanced Enterpreneurship Training, you will understand the basics of Business Administration, Finances and Operation; moreover, learn what is required to run a company of your own.You will also specialize in forming strategies, plan and manage resources and clients; take business decisions to maximize the growth and revenue of the company.